Boeing 737 Max 8 planes will be grounded in U.S.
WASHINGTON (AP) - President Donald Trump says the U.S. is issuing an emergency order grounding all Boeing 737 Max 8 and Max 9 aircraft in the wake of a crash of an Ethiopian Airliner that killed 157 people. Many nations in the world had already barred the Boeing 737 Max 8 from its airspace, but until now, the Federal Aviation Administration had been saying that it didn't have any data to show the jets are unsafe. He says the safety of the American people is of "paramount concern." HEJERE, Ethiopia (AP) - Canada joined much of the world in barring the Boeing 737 Max 8 jet from its airspace on Wednesday, saying satellite tracking data shows possible but unproven similarities between the Ethiopian Airliner crash that killed 157 people and a previous crash involving the model five months ago. The decision left the U.S. as one of the few remaining countries to allow the planes to keep flying. Canadian Transport Minister Marc Garneau said a comparison of vertical fluctuations found a "similar profile" to the Lion Air crash that killed 187 people in October. Garneau emphasized that the data is not conclusive but crossed a threshold that prompted Canada to bar the Max 8. He said the new information indicated that the Ethiopian Airliner jet's automatic system kicked in to force the nose of the aircraft down after computer software determined it was too high. He said that in the case of the Lion Air crash off Indonesia, the pilot fought against computer software that wanted to drop the nose of the plane. "So if we look at the profile, there are vertical fluctuations, in the vertical profile of the aircraft and there were similarities in what we saw," Garneau said. "But I would repeat once again. This is not the proof that is the same root problem. It could be something else." Canada lost 18 of its citizens in Sunday's crash, the second highest number after Kenya. A Canadian family of six were among the dead. Meanwhile, Ethiopian Airlines said Wednesday that flight recorders from the jet that crashed will be sent abroad for analysis, but it was unclear where. Some aviation experts have warned that finding answers in the crash could take months. Boeing has said it has no reason to pull the popular aircraft from the skies and does not intend to issue new recommendations about the aircraft to customers. 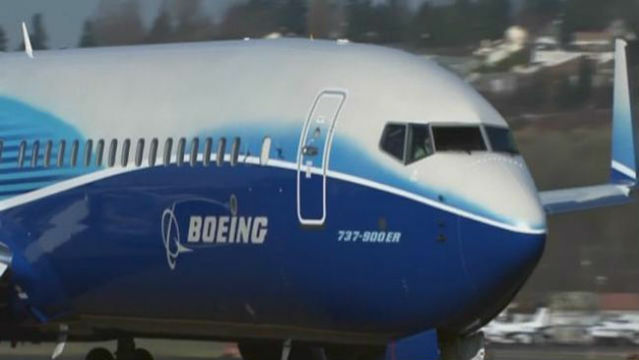 Boeing CEO Dennis Muilenburg spoke with President Donald Trump and reiterated that the 737 Max 8 is safe, the company said. The U.S. Federal Aviation Administration has backed the jet's airworthiness and said it was reviewing all available data. "Thus far, our review shows no systemic performance issues and provides no basis to order grounding the aircraft," acting FAA Administrator Daniel K. Elwell said in a statement. The agency had no response to Canada's decision, saying it doesn't comment "on actions that other civil aviation organizations take." While aviation experts warn against drawing conclusions until more information emerges from the investigation, more than 40 countries - including the entire European Union - have suspended flights by the Max 8 or barred it from their airspace. China also ordered its airlines to ground the planes - they had 96 Max 8 jets in service, more than one-fourth of the approximately 370 Max jets in circulation. The list of countries continued to grow Wednesday. Lebanon and Kosovo barred the Boeing 737 Max 8 from their airspace, and Norwegian Air Shuttles said it would seek compensation from Boeing after grounding its fleet. Egypt banned the operation of the aircraft. Thailand ordered budget airline Thai Lion Air to suspend flying the planes for risk assessments. Lion Air confirmed reports it has put on hold the scheduled delivery of four of the jets. Ethiopian Airlines, widely seen as Africa's best-managed airline, grounded its remaining four models. And airline pilots on at least two U.S. flights have reported that an automated system seemed to cause their planes to tilt down suddenly. Ethiopia was searching for another country to take the black box from Sunday's plane crash for analysis. Germout Freitag, a spokesman for Germany's Federal Bureau of Aircraft Accident Investigation, said that agency declined a request from Ethiopia to analyze the box because it lacked the software needed. A spokesman for Ethiopian Airlines, Asrat Begashaw, said the airline has "a range of options" for the data and voice recorders of the flight's last moments. "What we can say is we don't have the capability to probe it here in Ethiopia," he said, adding that it would be sent to a European country that he did not identify. An airline official has said one of the recorders was partially damaged. Boeing's technical team joined U.S., Israeli, Kenyan and other aviation experts in the investigation led by Ethiopian authorities. An Ethiopian pilot who saw the crash site minutes after the disaster told AP that the plane appeared to have "slid directly into the ground." Ethiopian Airlines CEO Tewolde Gebremariam said their pilots had received special training. "In addition to the basic trainings given for 737 aircraft types, an additional training was given for the Max version," Tewolde told state news reporters. "After the Lion Air crash, questions were raised, so Boeing sent further instructions that it said pilots should know. Those relate to the specific behavior of this specific type of aircraft. As a result, training was given by Boeing, and our pilots have taken it and put it into our manuals," he said. Tewolde said he is confident the "investigation will reveal that the crash is not related to Ethiopian Airlines' safety record." Forensic DNA work for identifications of the remains recovered so far has not yet begun, Asrat said. The dead came from 35 countries. More devastated relatives of victims arrived at the crash site Wednesday, some supported by loved ones and wailing. Others mourned in private. Dawit Gebremichael sat with a photograph of his only sister, Sara, a flight attendant on the plane. She left three children. "It is customary for Ethiopians to have a body and a proper burial," he told the AP. "But we don't have the body here, and we don't expect anything now." Gillies reported from Toronto. AP writer Yidnek Kirubel contributed from Hejere, Ethiopia.